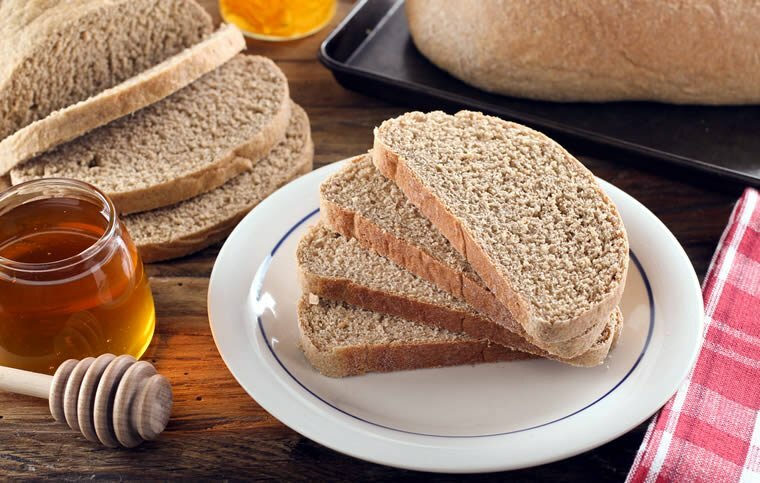 This Everyday 100% Whole Wheat Bread calls for coconut oil, which conventional wisdom says is high in saturated fat and therefore should be avoided. When I expressed that concern, she pointed out that there is increasing evidence that coconut oil has many redeeming health properties: It has high antimicrobial properties, is quickly used for energy, and contributes to the health of the immune system. She suggested reviewing the information and links at www.coconutoil.com. Fast forward a couple of years, and Andy Bellatti and I gave unrefined Coconut Oil a high ranking on our Cooking Oil Comparison Chart. It’s especially good for high-heat cooking, since it has a much higher smoke point than most other cooking oils. If you don’t want to use coconut oil, this recipe can also be made with butter (choose organic from grass-fed cows). Or, you can omit the fat altogether and this 100% whole wheat bread will still turn out great. 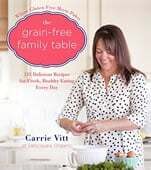 It’s very simple to put together and you can have fresh bread on the table in just two hours (most of that time is inactive, letting the dough rise). If you've been intimidated by homemade bread then this is the recipe for you. It's very simple to put together and you can have fresh bread on the table in just two hours. Makes 2 loaves. Melt the coconut oil or butter (if using) over low heat in a small saucepan. In a large bowl stir melted fat, warm water, 3 cups (350g) flour, honey and yeast. Cover the bowl with a clean towel and set in a warm, draft-free area for 30 minutes. Preheat the oven to 350°F and adjust rack to middle position. Uncover the bowl with the flour mixture in it and add remaining 4 cups (450g) flour and sea salt. Stir until just combined and then pour mixture onto a floured, flat surface. Knead the dough for one minute (if the dough is a bit sticky, add a tablespoon or two of flour). Cut the dough in half. Roll first half to a 12x9-inch (30x22-cm) (approximate) rectangle and then it roll up to form a loaf. Place the loaf seam side down on baking sheet lined with parchment paper. Repeat with second half of dough. After both pieces of loaves are formed, place a clean dish towel over the loaves and let them rise again in a warm, draft-free area for about 30 minutes or until they double in size. After dough has risen, remove towel and bake in the oven for 20 minutes, until golden brown. Another way to tell if the bread is ready is to thump the bread with your finger. If it makes a hollow sound, the bread is ready. Cool for 5 minutes before serving. 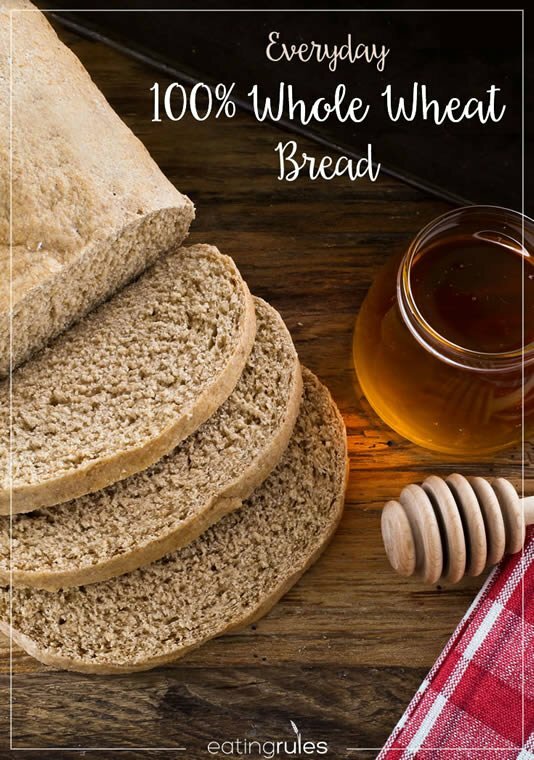 My family(including the dog) is so hooked on the 100 percent whole wheat bread with coconut oil and honey, that it is scary…I will check out the 100 percent whole wheat pizza crust next…ooooooopssssss gotta finish the bread to make the pooch happy!!!!!!!! Finally! A whole wheat recipe made with coconut oil. I have read that coconut oil is great for baking because it doesn’t break down or go rancid like canola oil does. It contains lauric acid which is found in few sources but is abundant in mothers milk. Glad you like it, Nance! Congratulations! The stand mixer is definitely a huge turning point in any cook’s life. 🙂 Love that your dog watches it bake… awesome! Has anyone tried a gluten-free version of this recipe? I typically use milled flax seed as a binder. Didn’t know if there were any other modifications needed.